This is the book I've been waiting for. Time travel is such an interesting thing and I love reading about how different people imagine it working. The reason I was so excited about this book was because I knew it had time travel, but it was also the reason I was a bit worried about it. Time travel can be a bit confusing even if there is an explanation for it. The book switched between Em and Marina's POV. Em's world is a future destroyed by the invention of the time machine aka Cassandra and Marina is from the present. It was obvious to me from the beginning how the two characters were connected, especially when Em refused to say the doctor's name and the name of Marina's friend was revealed, but I'm not going to say any more about that. At some points it was difficult to tell the difference between Em and Marina's POV especially at the end, mostly because there were so many characters from the future and the past mixing together. Aside from that, I really enjoyed both of the girl's stories. Em's was a bit more intriguing because her story contains more action than Marina's and in the beginning Marina is very shallow and kind of boring. All Marina ever thinks about in the beginning is how much she loves James, but as the story progressed I warmed up to her because there was more to her than I originally thought. There is a very complicated love story woven into this book and I'm tempted to call it a love triangle, but that's not exactly correct (and if I tried to explain the love triangle I would end up spoiling some parts so I'm going to stay away from calling it that). The story starts out with Marina already in love with James (her best friend). Normally this would make their relationship less appealing, but the flashbacks to times Marina was with James and the obvious fact that she knew him better than most people allowed me to go along with their relationship. Em and Finn's relationship seemed like that at first, but its clear after awhile that they don't suffer from insta love and that their relationship developed over time. I ended up preferring Em and Finn over Marina and James mainly because Finn is so adorable and sometimes James seemed to be toying with Marina's emotions. The explanation for time travel was quick so it didn't feel like the author was info dumping and it wasn't overly complicated. The explanation was reminiscent of the one given in the TV show Doctor Who and I don't want to ruin the explanation for anyone because I think it was brilliantly executed so I'm not going to say any more about it. 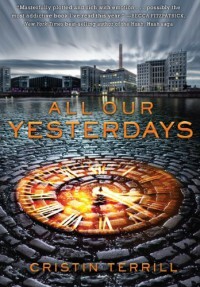 All Our Yesterdays is definitely one of my favorite books now and I'm going to be looking for more books by this author in the future.